Opening with the jangly melodic rush of ‘Velocity Girl’, ‘Maximum Rock ‘N’ Roll: The Singles’ is a celebration of a vital catalogue of songs from a band who have always pushed the boundaries of their sound. There’s rock ‘n’ roll infused with gospel and soul in ‘Movin’ On Up’, the Stonesy strut of ‘Rocks’ and industrial-funk in the shape of ‘Kill All Hippies’. And that freewheeling attitude never stopped, as evidenced by the anthemic garage-rock meets vintage R&B of ‘Country Girl’ and the creativity of the songs taken from their most recent album, 2016’s ‘Chaosmosis’. 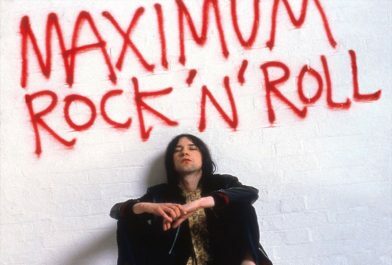 Maximum Rock N Roll: The Singles collection is divided into two parts Vol 1. 1986-2000 and Vol. 2 2000-2016, both on 2xLP. Volume 1 features 17 tracks, including ‘Rocks’, ‘Moving On Up’ and ‘Come Together’. Volume 2 features 14 tracks including Andrew Weatherall’s ‘Uptown’ mix, and ‘Some Velvet Morning’ featuring Kate Moss. Check out the full Maximum Rock ‘N’ Roll tracklist below.